He graduated from the Faculty of Fine Arts and Design at Institut Teknologi Bandung (ITB, Bandung Institute of Technology) in 1986, and finished his post graduate studies at DAAD Stipendium in Germany in 1998. Actively exhibiting, his work has been in Solo and group exhibitions, locally and abroad at Sahmat Memorial Trust Exhibition in New Delhi, India in 1997, ‘Against Impunity’ in Amsterdam, the Netherlands in 1999, Venice Biennale in Italy in 2003, and Gwangju Biennale, Korea in 2004. His painting was among the ten best in the Phillip Morris Indonesia Art Awards 1995 and 1997, he also won awards from Sapporo International Print, Japan in 1998. The art education of Tisna Sanjaya started with Graphic Art, but he works with all kind of media. His graphic works portray the theme of human drama, executed with fine quality intaglio technique and lithography. Paintings depict the problems of humanity, injustice, and are full of drama, like theatre scenes on a stage, perhaps because of his experience as an artistic director for a number of theater performances. Tisna is also a ‘happening’ artist and creates extremely intensive performance art. His two most recent works voice both themes of humanity and environmental issues. He has planted Melinjo trees in many parts of Java, placing sublime notices such as ‘Trees don’t grow up in a hurry’. 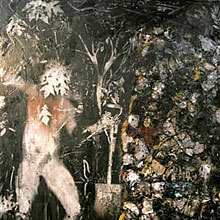 In 2004 one of his installations art work in Bandung was burnt by the public order and city waste authorities.